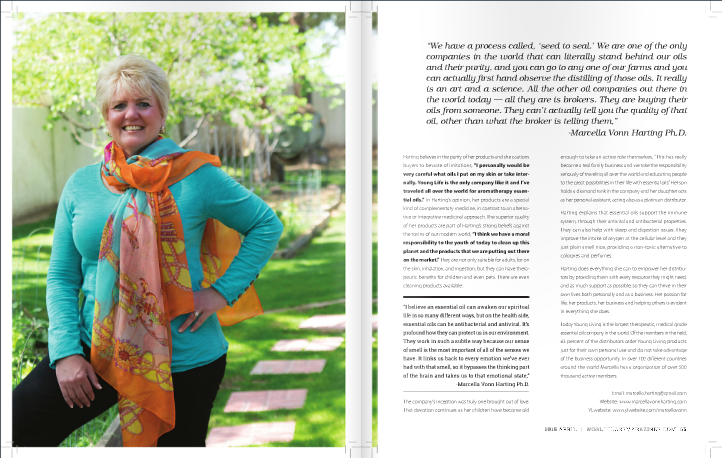 The story of Marcella Vonn Harting Ph.D. and her Young Living essential oil company is one that moves through harrowing adversity into hope and beneficence. It began 31 years ago, when Harting’s daughter swallowed meconium during her birth. As a result, she had to have her lungs suctioned for six and a half hours. Harting reports that at the age of 7 months, her daughter died and had to be resuscitated twice, “my little girl died in my husband’s arms,” causing an irreparable lack of oxygen to the brain, according to the doctors at the hospital. “I refused to take that diagnosis and I went searching . I went back to school to learn about nutrition and started looking at everything out there and of course all my friends and family were searching too, and that’s how the networking products got brought into my life,” Marcella Vonn Harting Ph.D. While essential oils and aromatherapy is a global phenomenon today, it was virtually unheard of then. Harting emphasizes that at first had no interest in building a business. She was just looking for a way to help her daughter, “I believe if you give the body what it needs, on a cellular level, the body can regenerate, and I don’t know where I got that. It’s just an innate knowing.” Today Young Living has more than 500 thousand active distributors, to become the largest therapeutic, medical grade essential oil company in the world. Of the members in the field, 83 percent of the distributors do not order Young Living and do this as a business. They are just buying the products for themselves. Harting has appeared on CNN, ABC, NBC and on radio. 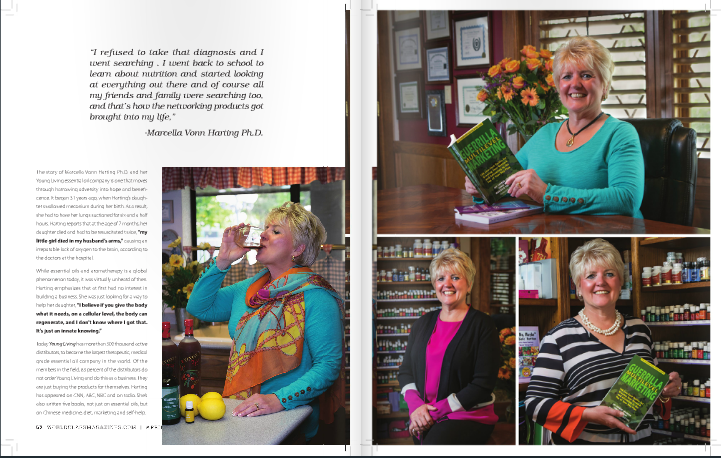 She’s also written five books, not just on essential oils, but on Chinese medicine, diet, marketing and self-help. “There are so many things we can do before we have to go to drugs. It’s about thriving and giving people back their passion in their life. That’s really what I’m all about,” Marcella Vonn Harting Ph.D.
Harting believes in the purity of her products and she cautions buyers to beware of imitations, “I personally would be very careful what oils I put on my skin or take internally. Young Life is the only company like it and I’ve traveled all over the world for aromatherapy essential oils.” In Harting’s opinion, her products are a special kind of complementary medicine, in contrast to an alternative or integrative medicinal approach. The superior quality of her products are part of Harting’s strong beliefs against the toxins of our modern world, “I think we have a moral responsibility to the youth of today to clean up this planet and the products that we are putting out there on the market.” They are not only suitable for adults, for on the skin, inhalation, and ingestion, but they can have therapeutic benefits for children and even pets. There are even cleaning products available. “We have a process called, ‘seed to seal.’ We are one of the only companies in the world that can literally stand behind our oils and their purity, and you can go to any one of our farms and you can actually first hand observe the distilling of those oils. It really is an art and a science. All the other oil companies out there in the world today — all they are is brokers. They are buying their oils from someone. They can’t actually tell you the quality of that oil, other than what the broker is telling them,” Marcella Vonn Harting Ph.D. The company’s inception was truly one brought out of love. That devotion continues as her children have become old enough to take an active role themselves, “This has really become a real family business and we take the responsibility seriously of traveling all over the world and educating people to the great possibilities in their life with essential oils.” Her son holds a diamond rank in the company and her daughter acts as her personal assistant, acting also as a platinum distributor. “I believe an essential oil can awaken our spiritual life in so many different ways, but on the health side, essential oils can be antibacterial and antiviral. It’s profound how they can protect us in our environment. They work in such a subtle way because our sense of smell is the most important of all of the senses we have. It links us back to every emotion we’ve ever had with that smell, so it bypasses the thinking part of the brain and takes us to that emotional state,” Marcella Vonn Harting Ph.D.
Harting explains that essential oils support the immune system, through their antiviral and antibacterial properties. They can also help with sleep and digestion issues. They improve the intake of oxygen at the cellular level and they just plain smell nice, providing a non-toxic alternative to colognes and perfumes. Harting does everything she can to empower her distributors by providing them with every resource they might need, and as much support as possible, so they can thrive in their own lives both personally and as a business. Her passion for life, her products, her business and helping others is evident in everything she does. Today Young Living is the largest therapeutic, medical grade essential oil company in the world. Of the members in the field, 83 percent of the distributors order Young Living products just for their own personal use and do not take advantage of the business opportunity. 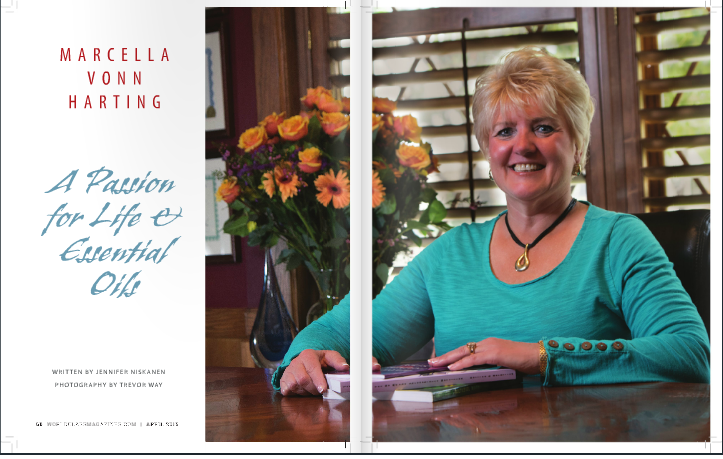 In over 100 different countries around the world Marcella has a organization of over 500 thousand active members.